At a press conference before last weekend’s Life Ball in Vienna, AIDS LIFE Chairman and Life Ball CEO Gery Keszler described the primary effect of the massive annual party: “We’re making a loud scream for awareness.” We’ve already recounted some of the over-the-top antics that help that scream get heard by the 40,000-plus attendees of the Life Ball Opening Ceremony and legions of media, but Life Ball does a lot more for the HIV-positive community and those living with AIDS. For starters, the hard-partying guests are doing their own part, as profits from the Life Ball cash bar go to supporting the net proceeds, thanks to donations from sponsors and restaurant partners. Additionally, ticketed events, VIP areas, an auction featuring a gown worn by Conchita Wurst, tickets to the Golden Globes and a trip to Paris help drive the funds generated. In 2014, the Life Ball raised 2.3 million euros. One of the most visible beneficiaries of Life Ball each year is the recipient of the Crystal of Hope Award, donated by Swarovski. The chosen organization receives 100,000 euros to further their work. This year, Sentebale was selected. Founded by Prince Harry and the Prince of Lesotho, Sentebale works with young boys in Lesotho’s highlands. The Herd Boys Programme establishes night schools for the boys, some as young as five years old, tending livestock and otherwise not receiving any other education. Literacy for males in the country is just 56 percent. Sentebale’s night schools provide a basic education as well as testing and sexual health services to understand how HIV is transmitted. 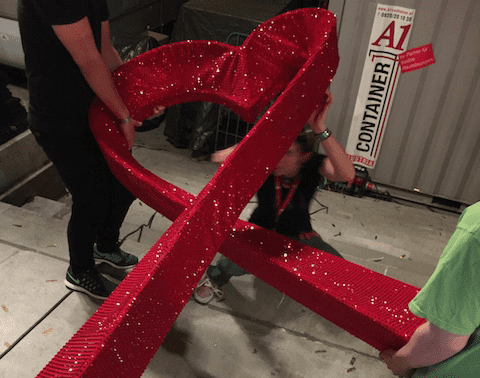 The first Crystal of Hope Award laureate was amfAR, who returned to Life Ball this year to cooperate closely with AIDS LIFE on their TREAT Asia Project, a network of medical facilities in Southeast Asia treating HIV/AIDS. In India, Life Ball works with the Clinton Health Access Initiative, which was represented at this year’s event by actor Sean Penn. Other legacy relationships continuing this year, include the Elton John AIDS Foundation, MTV Staying Alive Foundation, UNAIDS, and The Global Fund to Fight AIDS, Tuberculosis and Malaria. One new organization working with Life Ball is the Charlize Theron Africa Outreach Project, founded by the Academy Award-winner Charlize Theron. “Growing up in South Africa, I saw the devastation of AIDS at a young age,” Theron told the press conference Saturday. “This disease has shaken my country. An estimated 6.4 million people are living with HIV in South Africa. That’s more than anywhere else in the world. We are one percent of the population, and we represent 18 percent of people living with HIV.” Her charity is focused on sub-Saharan Africa, the region most affected by HIV.